On 29th October 2012 there was much excitement when a host of scientific manuscripts by Émilie du Châtelet went under the hammer at Christie's in Paris. They included a corrected version of her translation of Newton, Exposition abrégée du système du monde selon les principes de Mr Newton, two unpublished works on Newton's optics and various studies on geometry, arithmetic and physics. A copy of Voltaire's Eléments de la philosophie de Newton contained annotations by both Madame du Châtelet and Voltaire himself, confirmation - if any were needed - that.Émilie was the brains behind the work. Lesser lots included parts, written up in the hand of Voltaire's secretary Longchamp, from three theatrical works performed at the "petit théâtre". Lot 3: Portrait of Emilie after Marianne Loir. The story behind the sale is nice tale of unexpected rediscovery. Almost nothing remains of the original furnishings from Cirey and Madame du Châtelet's papers had long been supposed destroyed, either on her death in 1749 or after the execution of her son, Louis Marie Florent du Châtelet, in 1793. But in 2010 the whole family archive was miraculous found intact in ten wooden boxes in the attic of a house in Rosnay-l'Hôpital (Aube), where Cirey's inheritors had moved when the chateau was sold in 1892; up to this time the documents had been tenaciously guarded by an elderly female descendant. Documents concerning the chateau, dating back to 13th century, were deposited in the Departmental Archives of Haute-Marne at Chaumont. But there was no legal impediment to the sale of Madame du Châtelet's personal manuscripts and joy gave way to concern as the scholarly community anticipated the break-up of the newly acquired collection. Despite a campaign which resulted in a petition from 1,4000 researchers worldwide, the French Ministry of Culture did not move to preempt. 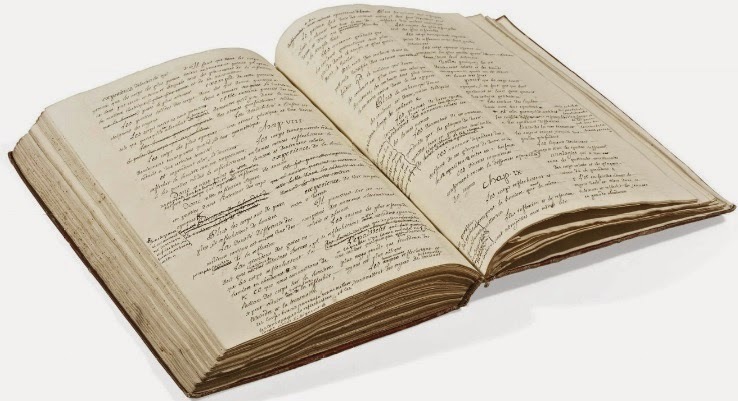 The auction went ahead and the manuscripts made record prices: € 961,000 (double the estimate) for the Exposition abrégée; € 421,000 for Voltaire's Eléments de la philosophie de Newton (against an estimate of € 60,000); four times the expected amount for two works on optics. All was, indeed, not well - as became apparent last November, when the museum and various branches of Aristophil were subject to a dramatic descente by the anti-fraud brigade......The company is accused of “deceptive marketing practices," and“gang fraud."(!) Aristophil's basic scheme sounds like something out of the 18th-century. Clients are invited to "buy" lots - effectively acquire shares - in rare manuscripts, with promises of attractive returns. The market has been artificially inflated by the company's own aggressive buying strategy. This is big money: Aristophil are said to own five percent of the global books, letters and manuscript market estimated at three billion euros a year. They have created a "speculative bubble" which is now set to burst. Legal proceedings against them started as early as 2010 and one of the objectives of November raids was to seize assets for Aristophil's clients. "Les manuscrits et souvenirs d'Emilie du Châtelet vendus pour 3,28 millions d'euros", L'Obs 29/10/12. Andrew Brown, " 'Minerve dictait et j’écrivais':les archives Du Châtelet retrouvées" Cahiers Voltaire, 11 (2012), p.7-9. €500 Million Ponzi Scheme Suspected at Paris Museum" Artnet, 20/11/14.